U.S. government-sponsored student loan debt has become an escalating problem for the finances of many American households. 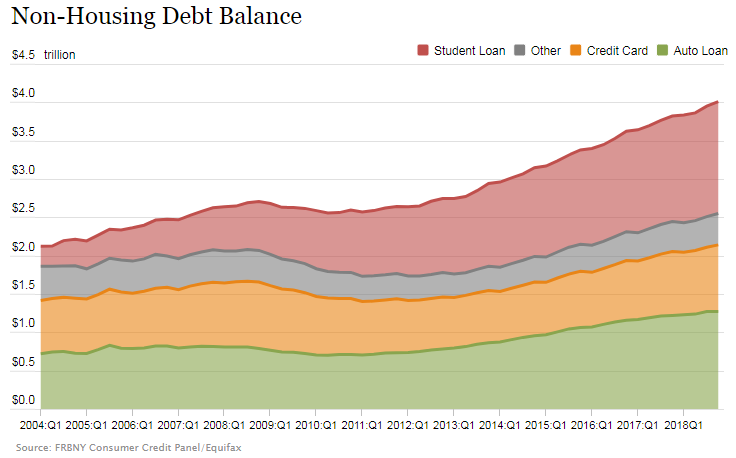 The latest household debt report from the New York branch of the Federal Reserve indicates that Americans collectively owed $1.46 trillion in student loans at the end of 2018, more than any other category of non-housing related debt. Worse, the percentage of student loan debt that is in “serious delinquency”, where no debt payments have been made for at least 90 days or longer, has remained stuck within a range between 10.7% and 11.8% of the total borrowed since 2012, the highest of all forms of household debt. 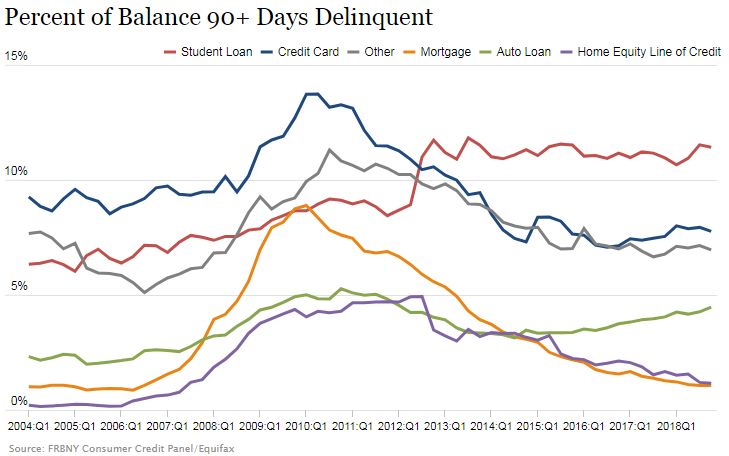 Bloomberg Quint‘s Alexandre Tansi crunched the numbers and found the amount of delinquent student loan debt has reached a new high. Since most of that money was borrowed from the U.S. government, the inability of American households to repay student loans represents a drain on the U.S. government’s finances, where seriously delinquent student loans drive up the nation’s budget deficits. While Powell said he couldn’t quantify what the longer-run economic effects would be, he said there is danger down the road. For example, growing student loan debt can crowd out home purchases by claiming a portion of a household’s income that might otherwise go to build its wealth. Because of this effect, student loans contribute to putting home ownership out of reach for many American households. Powell has also suggested that student loan debt should once again be allowed to be discharged in personal bankruptcy proceedings. This solution would go a long way to providing tangible relief from the negative burden that student loan debt is having on American households, without increasing the problem of moral hazard that would explode if it were simply forgiven by government fiat. Unfortunately, doing so would increase both the U.S. government’s deficits and the national debt unless other serious reforms are adopted. First and foremost, the U.S. government needs to get out of the business of making student loans altogether, which has been a costly money loser for the federal government ever since it took over the industry in 2010. Returning the business to the private sector will directly protect U.S. taxpayers from the growing costs of student loan delinquencies. Second, public policy needs to recognize that the main reason these serious delinquencies exist is because student loan borrowers did not get their money’s worth for the education they received at the academic institutions where they spent the proceeds from their student loans, where their post-education incomes are proving to be insufficient to pay back the money they borrowed. Under current law, academic institutions will only bear a portion of that cost by having funds they receive from the federal government cut if as many as 30% of its student loan borrowers default on their student loans. That extreme exemption should be reformed so that any federal funds an academic institution might receive, either directly or through tax credits, will be reduced one-for-one for every dollar their former students are seriously delinquent on any student loans issued or guaranteed by the U.S. government. Academic institutions threatened by the loss of federal funds or tax credits could then avoid that outcome by providing timely rebates to their financially struggling former students, and could even help bring their student loans payments down to more affordable levels by paying down the principal owed. Many institutions could even fund such a debt reduction program by reversing the administrative bloat that most have experienced during the last decade. Shrinking that bloat would even make the cost of college more affordable in the first place. If we’re serious about reforming student loans, why shouldn’t all Americans exploited by the current system benefit?